It's important to spend quality time with your loved ones away from all the responsibilities of everyday life. In the lush forests of Nisswa, Minnesota, on 35 stunning natural acres, you will find the Upper Cullen Resort, a family owned and operated destination where they understand how special it is to reconnect with your family. Upper Cullen Resort specializes in family getaways. The resort rests in a truly secluded and peaceful wooded area in northern Minnesota and they do not allow loud, partying crowds so you can rest assured this is a place where you and your family can relax and have fun together without distractions. They design children's activities throughout the week that are based on the age and number of kids that are visiting at the time. 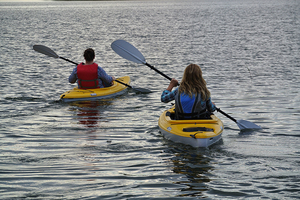 Aside from the scheduled activities, Upper Cullen Resort offers a variety of exciting adventures to enjoy at your own leisure. Their prime location along the shores of the Upper Cullen Lake and minutes from the rest of the Cullen Chain of Lakes makes them an ideal destination for a classic Minnesota lake vacation. Enjoy their swimming beach area where the kids can enjoy a swim or splash around along the shore. If that's not enough, rent a kayak or canoe to explore the waters, or rent a fishing boat so you can teach the kids how to cast their very first line. The resort also features other games and activities such as bean bag toss, shuffleboard, badminton, tether ball, and even a kid's playground! When you're not enjoying all the fun family-friendly entertainment, you can easily relax in your cabin or campsite. The resort features one, two, three, and four-bedroom cabins as well as a spacious campground for a more rustic vacation experience. 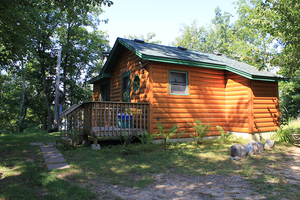 Cabins include amenities such as air conditioning, free wireless internet, picnic table, and your own individual campfire ring that's perfect for roasting marshmallows at the end of the day! Ever since its start in 1928, Upper Cullen Resort has been a staple of Minnesota family retreats. "We've been coming here since 1989 and it feels like coming home," said past guest, Elaine. "Year after year, we’re made to feel special and welcome. Perfect place to make memories!" The peaceful and friendly atmosphere of Nisswa only adds to your relaxing experience. In fact, Nisswa has been named the "Best Small Town In Minnesota" by WCCO Viewers! So when it comes to family fun, family relaxation, and family memories, there is no better place than Upper Cullen Resort. Plan your trip today and join this incredible family!